We manufacture lathe cut washers at our facility in Warrington. Lathe cut washers (also called lathe cut rings) are manufactured from extruded, mandrel built or moulded rubber tube usually with a ground finish on the outside diameter. These precision made tubes are then put onto a lathe and washers parted off to the required thickness. The resulting washer/ring has square cut edges giving either a square section or rectangular section. This method of manufacture is usually employed for either very large volumes, or for washers that cannot easily be press cut from sheet or strip, or where the required material is not readily available in sheet format. Lathe cut washers can be manufactured to fit into O-ring housings - if you have such a requirement then please contact our sales office. 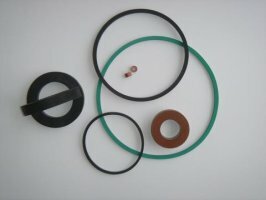 Lathe cut washers can be made in most materials, however our standard materials are: Nitrile, Neoprene®, EPDM, Natural rubber, Silicone and Viton®. We can offer these in a range of hardnesses from 35° to 95° Shore A.